Get started with your computer vision enabled project with this simple to be integrated camera module which works directly with our Ixora Carrier Board. The CSI Camera Module 5MP OV5640 is an add-on board for the Apalis computer-on-module which uses MIPI-CSI Interface. It enables to prototype machine vision applications and to take advantage of the advanced capabilities of Toradex modules to run deep neural networks, GPU accelerated OpenCV and other high-performance graphics applications. It uses the OmniVision OV5640 camera sensor with built-in auto-focus. The OV5640 image sensor is a low voltage, high-performance, 1/4-inch 5 megapixel CMOS image sensor that provides the full functionality of a single chip 5 megapixel (2592x1944) camera. The CSI Camera Module 5MP OV5640 can be connected to the MIPI-CSI connector on the Ixora carrier board V1.1 using a 24 way 0.5mm pitch FFC cable. The CSI Camera Module 5MP OV5640 comes with the FFC cable included. 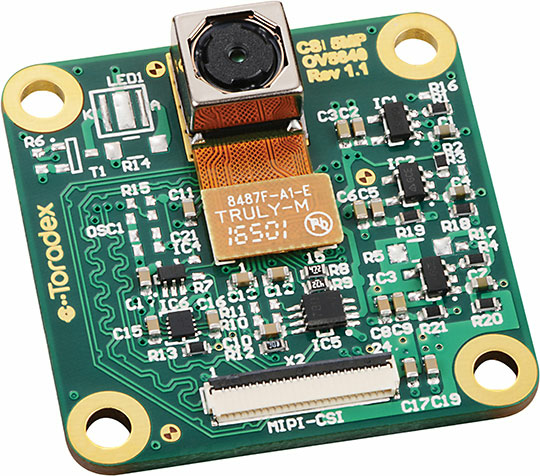 The CSI Camera Module 5MP OVA5640 is currently compatible with the Ixora Carrier Board V1.1. It will also be implemented in the next revision of the respective Mezzanine Boards so it can be used with the Apalis Evaluation Board.